Now, you can easily decorate the pot of plants/planter with branches of trees and get a sweet shape. This idea is very easy to do for the garden and agriculture in the vicinity of agriculture in fabulous, You can put this pot planter on the window shelf, or at the entrance of the house, gives natural view. Tools are easy to get, all you need is an empty pot planter and some fragile tree branches. Brushwood is cutting into small parts and pasted into the pot. 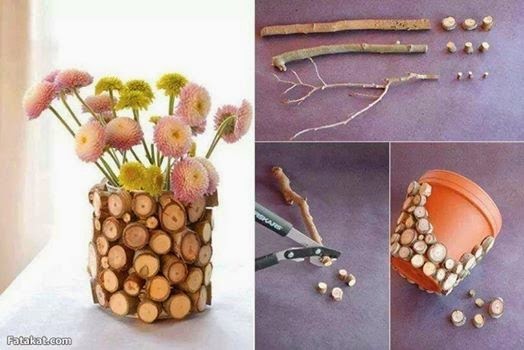 Watch the following GIF image to learn how to make your own tree branch planter with an easy and free tutorial. Wait a few seconds till the photo loads .. So we have finished writing the post DIY: How To Make A Pot Of Tree Branches and wish to offer you the interior designs so that you can share with friends and relatives on Facebook Twitter and Google Plus and other social networks and digital networks, also you can send comments through the box below to express your opinion on the article, so you could send suggestions and preferences to take into consideration for editing and adding, a bouquet of love appreciation and respect sent to you through Interior4Design platform.